What kind of channel should the Strategic and Economic Dialogue between China and the US be? Where is the future of the dialogue? Two experts express their views. The two-day Strategic and Economic Dialogue (S&ED) between China and the United States starts today. As reflected in the extraordinary array of participants - the US is represented by the largest delegation of Cabinet and sub-Cabinet officials ever sent to China - both governments accord this dialogue exceptional importance. The second S&ED will address an impressive array of mutual concerns. Economic and trade problems, encompassing everything from global economic developments to fears of protectionism to the yuan's value and more, will loom large. Bilateral cooperation on clean energy and energy security will be another major topic, with real progress likely. Diplomatic and security attention will focus especially on Iran and the Democratic People's Republic of Korea (DPRK) in the wake of the recent Cheonan sinking. Cross-Straits relations and other issues will be addressed, too. The S&ED is likely to be judged a success because the strength of the two delegations and the centrality of the issues discussed highlight the importance each government attaches to a constructive US-China relationship. But the S&ED could - and I believe should - be strengthened. Currently, it convenes once a year, with no ongoing mechanism that leverages this unique forum between annual meetings. Each year's agenda is developed via intensive consultations during the several months leading up to the annual dialogue. Each S&ED should instead agree on the core agenda for the next year's meeting and appoint a Cabinet/ministerial-level task force to work on that agenda throughout the year and make recommendations to the next dialogue. This could bring the S&ED far closer to achieving its purpose of addressing critical questions in depth and increasing mutual understanding. The issues of trade protectionism and cooperation in green technology, for example, are now high priorities for both the countries. With this suggested new approach, the S&ED could combine them and appoint a high level task force to recommend a concrete "US-China Green Technology Trade and Investment Initiative" to the 2011 dialogue. As of now, Beijing fears that domestic political pressures in the run-up to this November's US election may make President Barack Obama bend to pressures on Capitol Hill for trade measures to protect domestic jobs. China also chafes at the "buy America" provision in the US stimulus package. Americans, in turn, are deeply worried about the current government procurement practices in China as well as the potential protectionist consequences of various Chinese initiatives. They see massive government support for Chinese enterprises as potential "national champions". An invigorated program to develop domestic innovation appears to pose a danger that American firms will have to give up their core technologies and patents in order to access fully the vibrant Chinese domestic market. Licensing practices in sectors such as insurance effectively discriminate severely against foreign firms. And so forth. Such measures threaten to place American firms whose core competitive advantage lies in their advanced business practices and technology at a severe disadvantage. At the same time, low-carbon development is the wave of the future, and the US and China both have made clear they see this as a very promising sector for wide-ranging cooperation at government, scientific and corporate levels. Climate change, energy security and industrial competitiveness all center on this broad issue. Cooperatively developing and deploying "green" technologies, therefore, has potential to become a major pillar of US-China relations. There has already been significant progress, and more is likely in the coming two days. 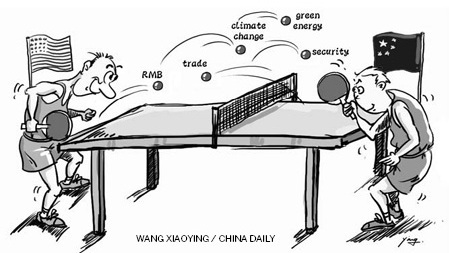 But greater impediments in four key areas constrain truly effective US-China cooperation on green technology overall. These are tariffs on related products, non-tariff barriers such as certification requirements, protectionist measures such as those noted above and restrictions on technology exports. Each of these is complicated technically and difficult politically. It would likely require putting all four issues together in one overarching package to produce sufficient benefits for each side to support the outcome. Arguably, only a process set up through the S&ED would have the high-level support required to bring together the right group of officials within each government to produce a viable "US-China Green Technology Trade and Investment Initiative" for the 2011 Dialogue. This type of effort would in turn strengthen the S&ED itself by enabling it to sustain activity around a critically important set of issues for the future of US-China relations - in this case, reducing protectionism and promoting cooperation in green technology. This proposal simply illustrates the type of change that can strengthen the S&ED and make it better able to fulfill its strategic role. The conclusion of this second S&ED tomorrow will provide both sides an opportunity to consider how to improve upon the existing S&ED process. A better process can in turn produce a better product, to the benefit of both countries.